In just five years there will be 100,000 more people in London and not enough lodging to fit them. 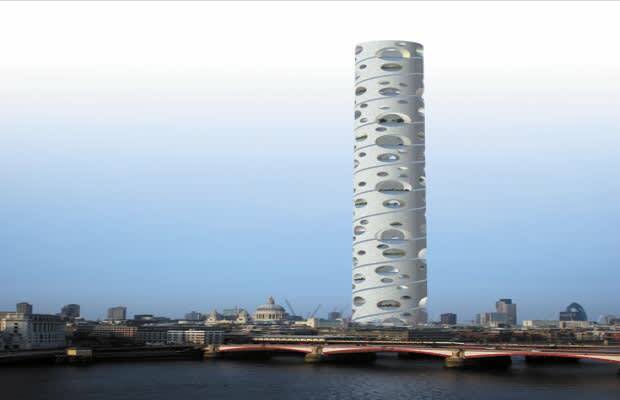 The firm Populararchitecture thinks a 5,000-foot tall, 450-floor phallic building that could shelter all 100,000 is the solution. Broken up into municipal areas—600 person neighborhoods, 12,000 person villages and 33,000 person districts—elected representatives would serve in local governments. What look like holes on the buildings exterior from afar, are common spaces housing a skating rink, botanical garden, theater and several tennis courts. A spiral road around the edge of the tower would connect the public space with the residential areas.